How would a priceless collection of Tiffany glass survive a catastrophic earthquake? Takeo Horiuchi didn’t want to find out. As one of the world’s most respected and passionate collectors of Louis Comfort Tiffany glass, lamps, and other decorative objects, Horiuchi learned last year that the new museum he was planning to build for his incomparable collection of fragile masterpieces was located in a highly active earthquake zone. Fearful that almost 20 years of effort might be turned into pricey piles of glass shards with a few ill-timed shakes of the earth, Horiuchi decided that protecting the objects he’d come to know and love was more important than owning them. Thus, he reached out to the same art-world insider who’d helped him acquire the collection to oversee its sale. The financial terms of the deal were obviously important (to paraphrase Muhammed Ali, ‘Ain’t nobody don’t need another five million dollars’…), but by all accounts, Horiuchi’s main goal was the safety of the work. Which is why the arrival of Takeo Horiuchi’s collection of Tiffany objects in the San Francisco Bay Area is so surprising. Like Mr. Horiuchi’s native Japan, San Francisco is in serious earthquake country. In fact, the new ZIP code for the collection, the small community of Alameda next door to Oakland, sits perilously close to an earthquake fault that’s even more active than the one that devastated much of San Francisco in 1906. What’s going on here? Two words: Allen Michaan, whose love for all things Tiffany, especially Tiffany stained glass, may rival Horiuchi’s. 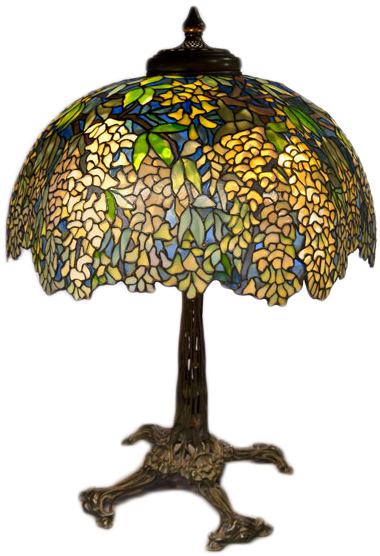 Michaan also happens to run a growing, regional auction house that bears his name, which means that by acquiring the Garden Museum collection from Horiuchi, Michaan will be dispersing some of the best examples of Tiffany Studios lamps, windows, mosaics, desk sets, vases, and paintings into the world. 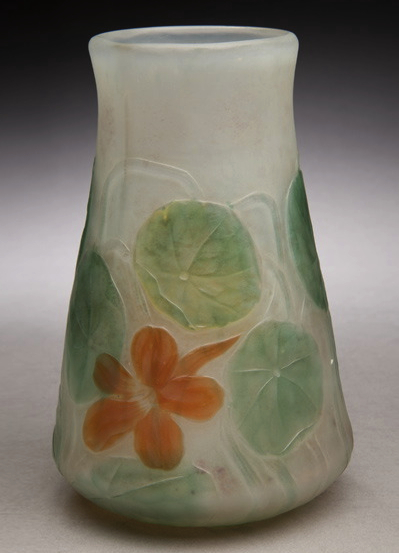 The first 170-plus Tiffany pieces from the Horiuchi collection will be auctioned off on November 17, 2012, at Michaan’s Auctions in Alameda, California. Titled “Treasures of Louis C. Tiffany from the Garden Museum, Japan,” the works will be on view beginning November 2. Above: Various stages in the window-making process are seen in a photo of the Tiffany Studios glass shop, circa early 1900s. 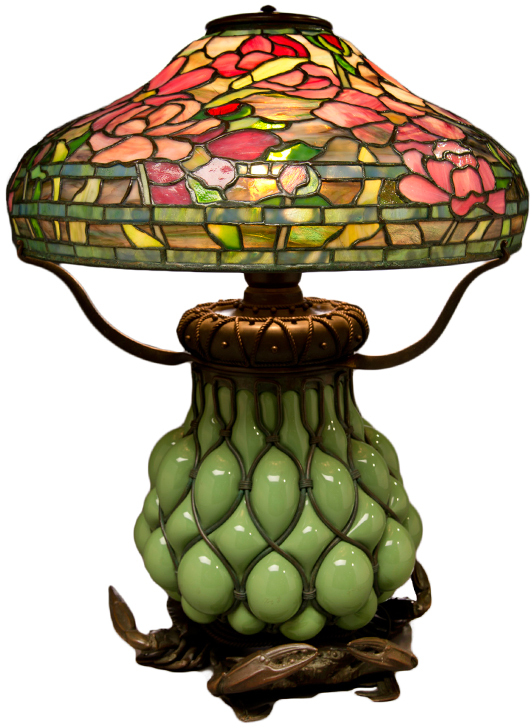 Top: This Peony Table Lamp, circa 1900, features a crab-motif base, which was used in some of the earliest, non-electric Tiffany lamps. No name in American decorative art is as revered as Tiffany. The Tiffany legend began in 1837, when Charles Lewis Tiffany (1812-1902) founded Tiffany & Co. in New York City, selling stationery supplies and gifts before making a name for himself in jewelry and sterling silver. By 1865, Tiffany’s customers included President Abraham Lincoln, who gave his wife, Mary, a Tiffany silver and seed pearl necklace, with matching bracelets, to wear at his second inaugural ball. By the mid-20th century, the word Tiffany was familiar enough to use in song lyrics (“Diamonds Are a Girl’s Best Friend”) and movie titles (“Breakfast at Tiffany’s”). 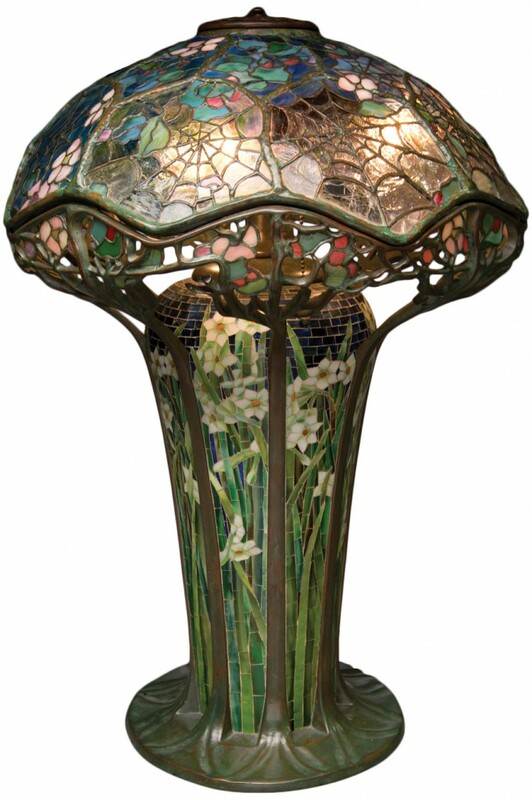 Tiffany’s son, Louis Comfort Tiffany (1848-1933), followed in his father’s footsteps, although he staked his reputation on decorative-art objects such as vases and lamps. 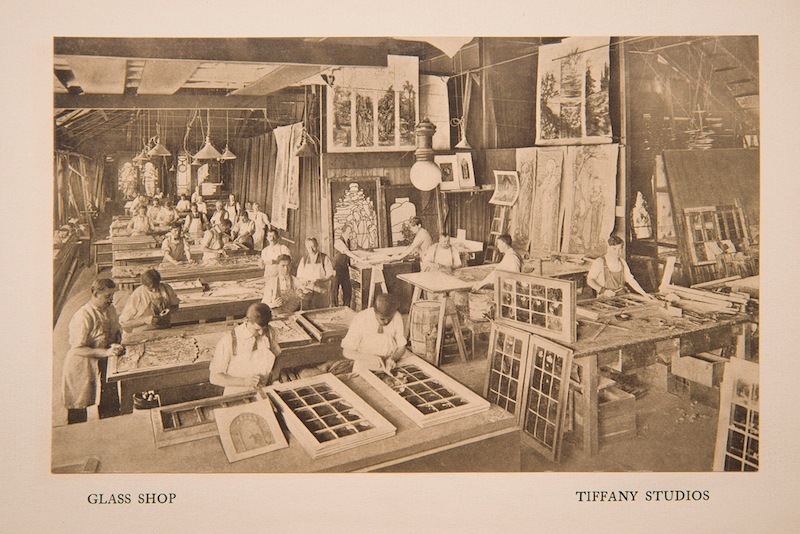 In 1879, the younger Tiffany launched Louis C. Tiffany and Co., Associated Artists. The firm’s preoccupation with blown and cut glass resulted in a name change to Tiffany Glass Co. in 1885, while its drive to diversify caused it to rebrand itself in 1892 as Tiffany Glass and Decorating Co. 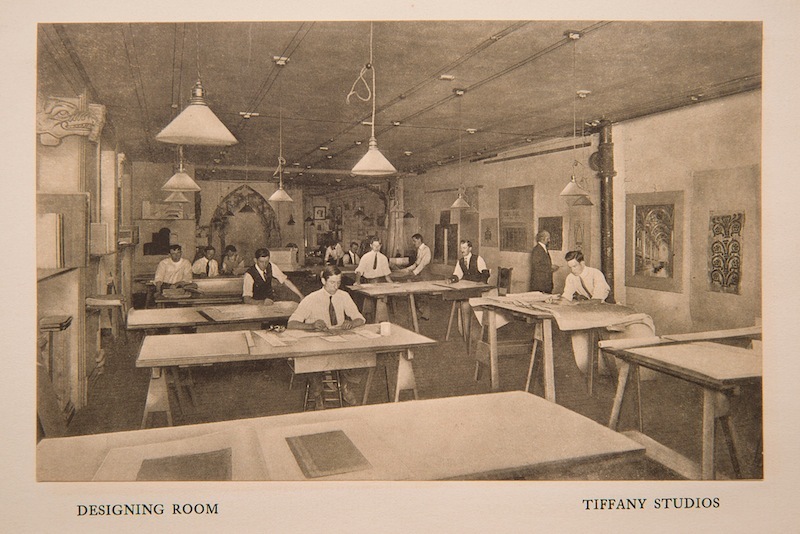 Finally, in 1900, Tiffany simplified his company’s name, but definitely not its product line, as Tiffany Studios, which went out of business in 1932. 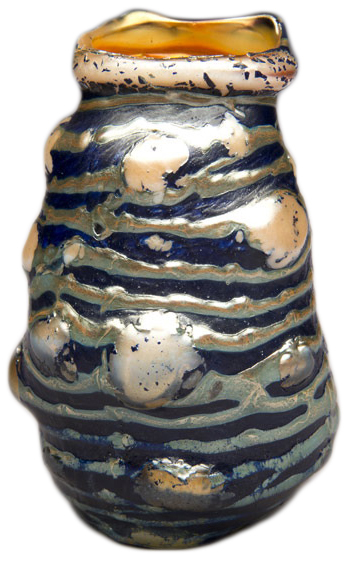 Left: This scent bottle from around 1905 is made of Cypriote glass and features an amethyst stopper. 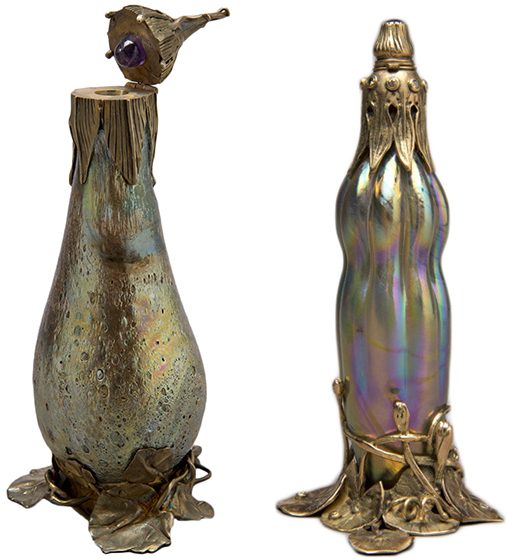 Right: Exhibited at the 1900 Exposition Universelle in Paris, this scent bottle comes with its own stand. Michaan’s resume is somewhat less storied than Tiffany’s. The Northern California auctioneer began his career in the arts running and restoring movie theaters (he still owns the Grand Lake Theater in Oakland), and is known to many in the San Francisco Bay Area as the guy behind the Alameda Point Antiques Faire, which attracts roughly 10,000 shoppers to an abandoned Naval Air Station runway on the first Sunday of every month. Though he’s collected Tiffany windows for more than 30 years, Michaan has only been in the auction business since 2002, making him a newcomer compared to stalwarts such as Sotheby’s, Christie’s, and Bonhams. 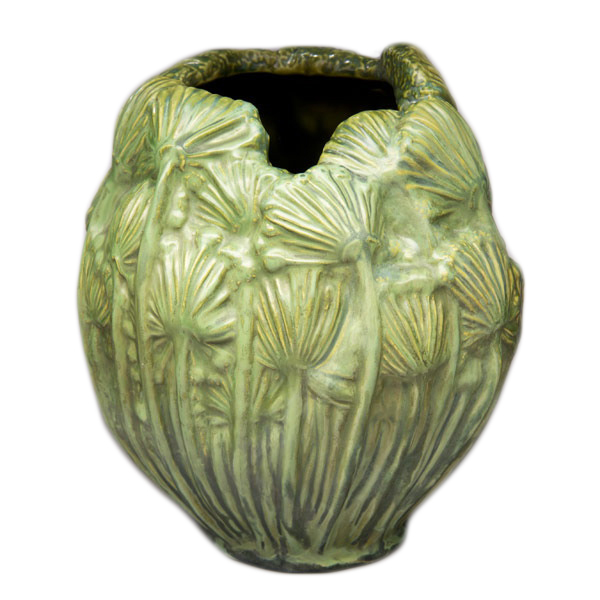 Tiffany artists often used Queen Anne’s lace as a design motif, including in this ceramic vase, made between 1905 and 1917. This Cobweb Table Lamp from 1900 or 1901, one of only seven known examples, is probably the most important piece in the Michaan’s auction. 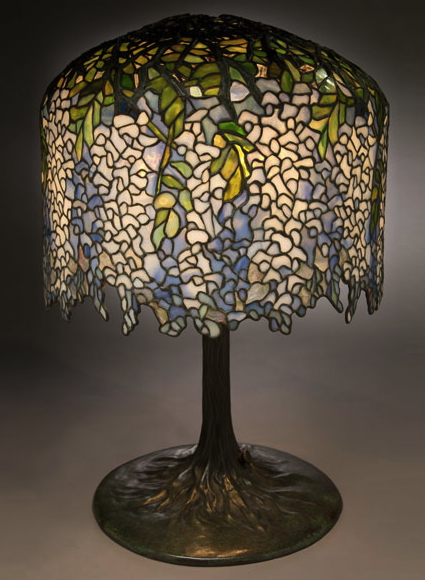 That collection included the best examples of Tiffany’s intricately detailed leaded-glass lamps, whose shades are ringed with dragonflies or drip with wisteria blossoms and whose Art Nouveau bases are formed from cast bronze; stunning stained-glass windows, produced for churches and private residences alike; and, of course, lots of vases, be they the Gallé-inspired Flowerforms, the iridescent peacock-feather-motif Favriles, or the deformed lava pieces, which were reportedly inspired by a trip Tiffany took to Sicily during an eruption of Mt. Etna. 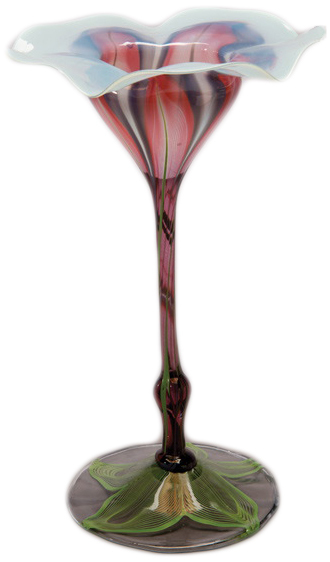 Lava glass was said to have been influenced by Tiffany’s experience of seeing Mt. Etna erupt in Sicily. But Horiuchi wanted more than just Tiffany’s Greatest Hits. He was also impressed by Tiffany Studios metalwork, from candlesticks and clocks to andirons and ash stands. On his behalf, Duncan sought out Tiffany Studios glazed earthenware, many of which took their forms from vegetables and flowers. And he went deep on Tiffany’s own paintings—as a young man, Tiffany studied with Hudson River School painter Samuel Colman, as well as George Inness, and he painted well into the later years of his life. To say that Horiuchi was ambitious for his collection is putting it mildly. He built his first Tiffany museum in Nagoya in 1994, and his second in Matsue in 2001. By 2011, Horiuchi was well on his way to building a third home for his collection (the first proved too small, the second was deemed too out of the way) when he abruptly decided to sell everything. 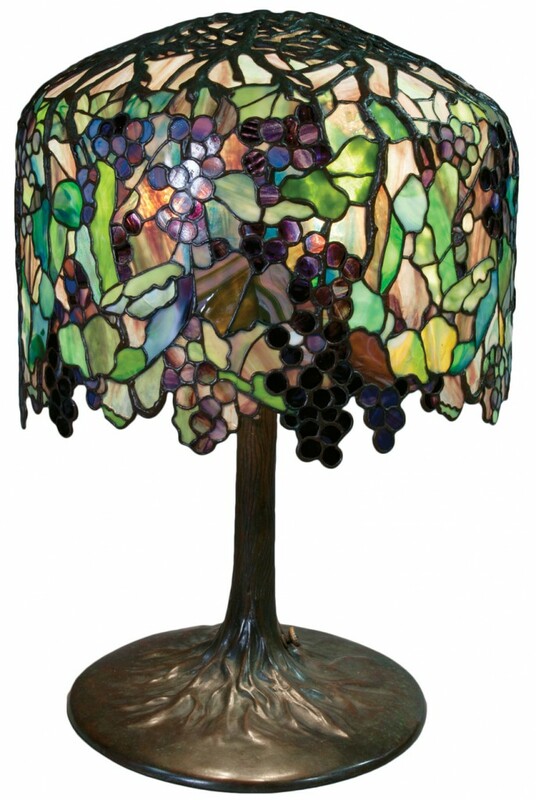 The “Elaborate” version of the Tiffany Studios Grape Table Lamp, shown here, had more grapes than the “Standard” version. Flowerforms such as this one were influenced by Tiffany’s exposure in 1889 to the work of Emile Gallé. Now that Allen Michaan is in control of the Garden Museum collection, he’s the one taking the risk, both from a business standpoint as well as for the collection’s safety. “The irony, of course,” says Duncan, “is that Michaan’s Auctions sits on top of the San Andreas Fault.” In fact, Alameda is closer to the Hayward Fault, which is actually more active than the better-known San Andreas. Still, with an auction just weeks away, the pieces probably won’t be there for long. A Laburnum lampshade mounted on what’s known as a bird-skeleton bronze base. These two panels are part of a wisteria triptych created between 1910 and 1915. “His particular passion is windows,” concurs Duncan. “So the major windows are not in there. 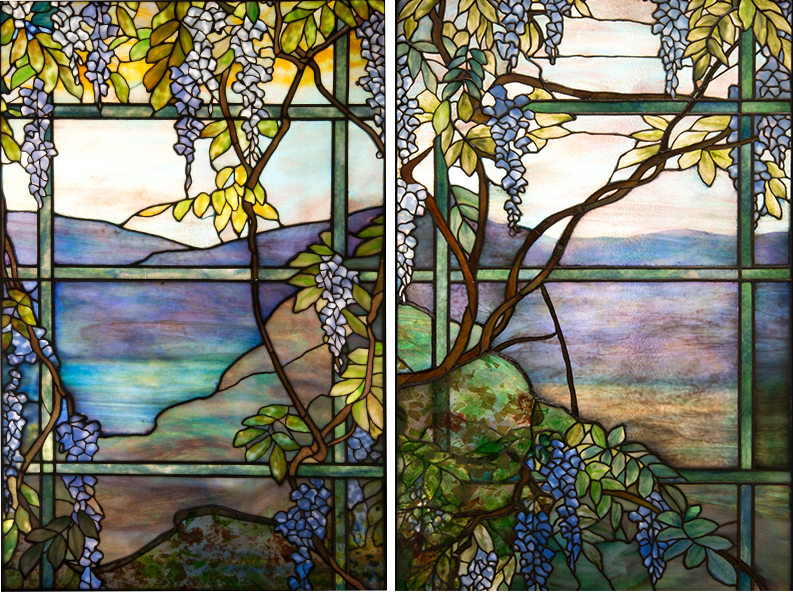 I don’t know how he’s determined what to keep and what to give up, but he’s obviously kept those items that he wants for himself.” For example, up for auction are two out of three panels from a 1910-1915 stained-glass triptych, depicting wisteria in the foreground and mountains off in the distance. Despite missing a panel, the two windows make a handsome pair. But it’s no Gould window, which is not up for auction in Alameda but was part of Michaan’s purchase of works from Horiuchi. Commissioned by Miss Helen Gould, whose father, Jay, was perhaps the most gilded tycoon of the Gilded Age, the Gould window was a major holding of the Garden Museum’s collection. Composed of some 4,000 pieces of glass, which are divided into eight horizontal panels that together stand 130 inches tall (i.e., it’s “huge”), this window was in Duncan’s “Masterworks of Louis Comfort Tiffany” exhibition, and a photo of the window on view at the Metropolitan Museum of Art in New York, as well as detailed documentation about its impressive provenance, take up several pages of the Garden Museum catalog. 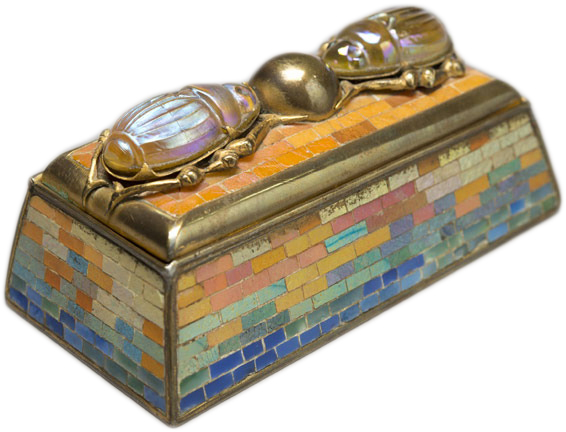 This Scarab Stamp Box was probably inspired by the craze for Egyptian Revivalism. 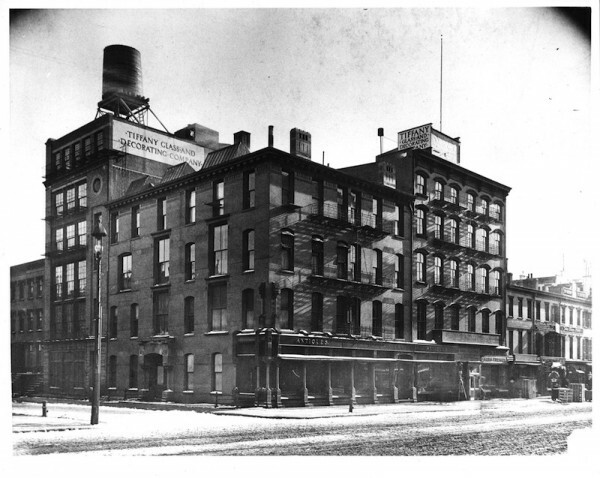 This three-building complex at 333-341 Fourth Avenue (now Park Avenue South at 25th Street) housed Tiffany’s decorating business from 1881 until the turn-of-the-century. This wisteria lamp is based on a sketch submitted by a client named Mrs. Curtis Freschel. 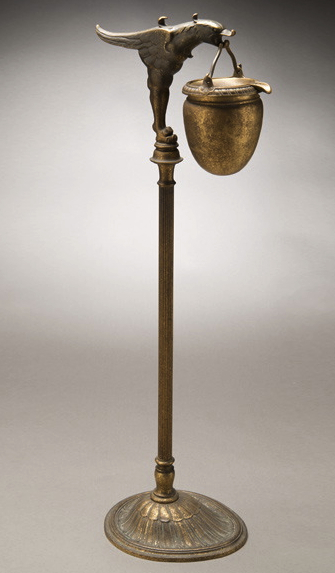 In 1906, the lamp's list price was $400. The auction estimate is $300,000 - $400,000. 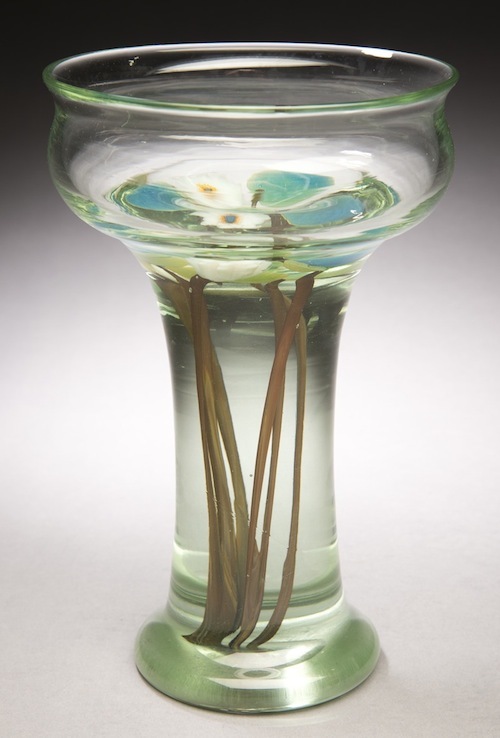 Aquamarine Glassware was introduced around 1911-1912. 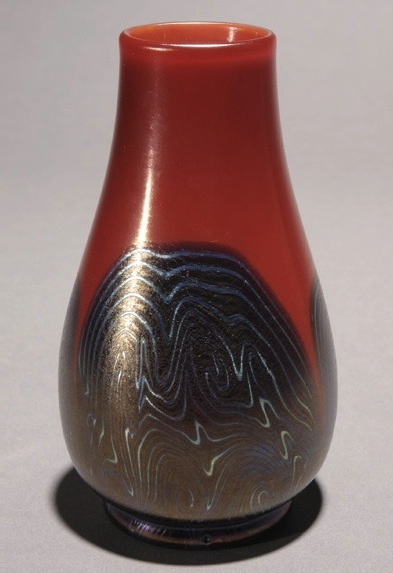 The red in this decorated vase was achieved by adding gold coins to the molten glass. Tiffany produced labor-intensive cameo vases with the help of highly skilled Austrian engravers. The Designing Room on Madison Avenue at 45th Street. 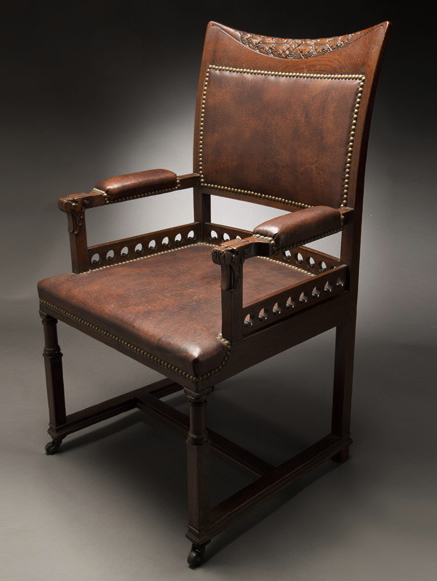 An early armchair, circa 1880, was one of Tiffany's first commissions. 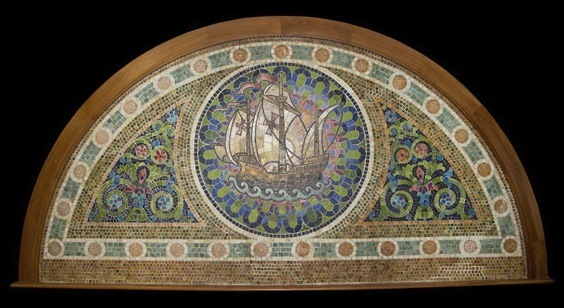 Allen Michaan once owned this glass mosaic from a New York State bank. Now he has the opportunity to sell it again. 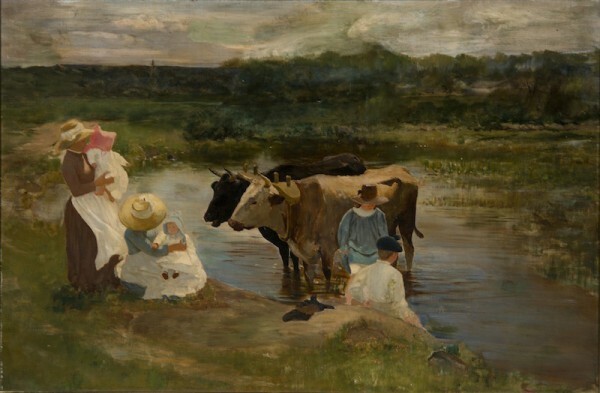 An oil on board Tiffany painting titled "Family Group with Oxen," 1888. This small (8 inches tall, with base) enamel tea screen was designed to shield the flame of a portable spirit lamp used to heat a kettle during afternoon tea. 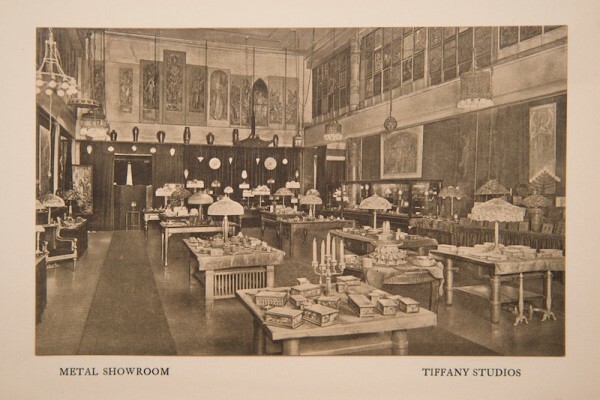 While many associate Tiffany with glass, his studio also made a great deal of metal objects, as this photograph of the firm's metal showroom attests. 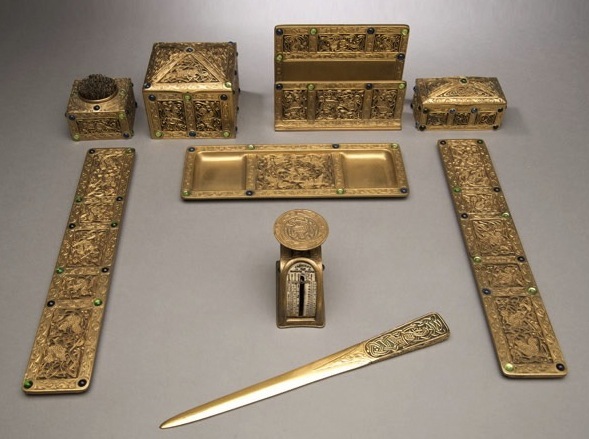 Tiffany Studios started selling gilt-bronze desk sets, such as its Ninth Century model, in 1900. 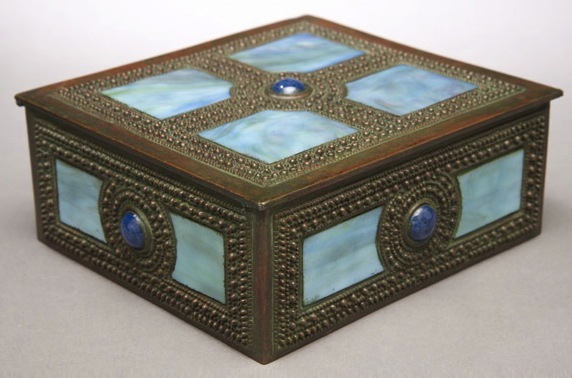 A bronze box inset with Tiffany Favrile glass. 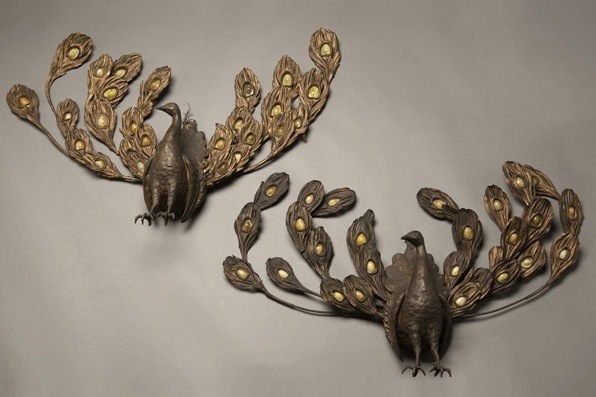 Some Tiffany metalwork appears downright tacky, such as this unfortunate pair of peacocks. 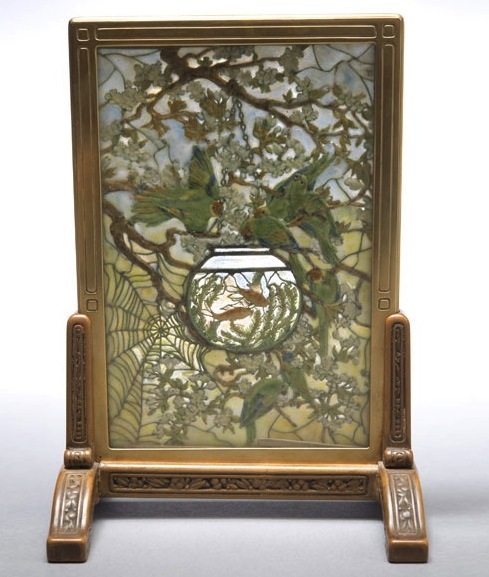 The Tiffany Studios Ash Stand was also advertised as a "Smoker's Stand." 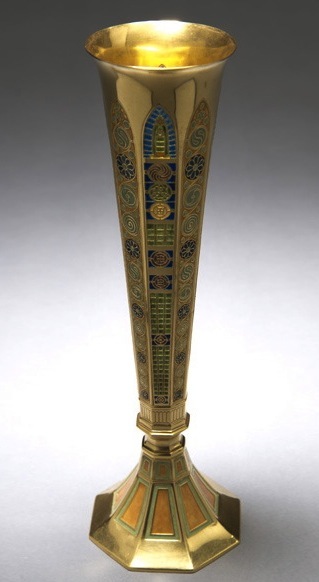 After 1907, Tiffany began to use gold in his metalwork, as in this Gothic-style vase. 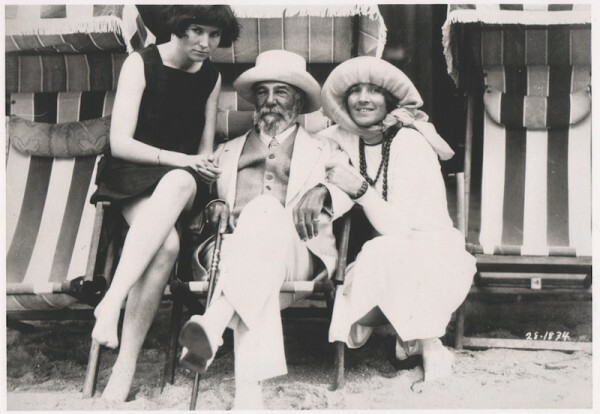 Tiffany on the beach in southern Florida, 1930. My teacher told us today about Alastair Duncan and showed us a beautiful book he wrote. So then we learned that he was sentenced to 2 years, 3 months in prison for participating in a theft and resale of a Tiffany window stolen from a cemetery. I can’t find any information about how long he actually went to prison and what he has done since then, etc. We would really like to know! “ ” I guess you're always freaking out a little bit when you're having a conversation with someone like Mark Hamill.